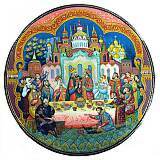 In ancient Russia there was a tsar named Saltan who married a lovely girl. She gave a birth to a handsome heir. At the time the Tsar was away at war and a rider was sent to him to convey the good news. But the jealous sisters of the queen and their evil friend Babarika kidnapped the rider and replaced him with their own messenger, who told the Tsar that the queen had given birth to neither son nor daughter, neither mouse nor frog, but to an unknown little creature. The tsar was very upset, but gave orders not to take any action before his return. The scheming sisters replaced the letter again with one that said that the queen and her baby had to be put into a barrel and thrown into the sea. Inside the barrel the tsarevich, named Gvidon, grew stronger every minute and started to beg the waves to wash the barrel onto dry land. The waved obeyed, and Gvidon and his mother found themselves washed ashore on a deserted island. Gvidon made a bow and arrows and went hunting. Near the sea he saw a poor swan struggling against a huge black hawk. Gvidon killed the hawk with his arrow and saved the swan's life. The swan thanked him in a human voice and said that she would serve him forever. Next morning the queen and her son discovered that a marvelous palace had appeared overnight out of nowhere. The people in the palace greeted them and proclaimed him tsar of the island. One day Gvidon wanted to visit his father and the swan turned him into a small insect. 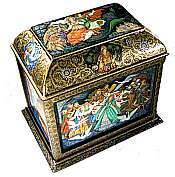 He visited Saltan's kingdom three times and overheard all the conversations in the palace. There he heard about three wonders: a squirrel which cracked golden nuts with emeralds inside and sang songs, a bodyguard of thirty-three knights who rose out of the sea led by their old uncle Chernomor, and a princess of stunning beauty. The swan first helped him to get the squirrel, then the knights. Finally, she herself turned into the beautiful princess. They fell in love with each other and married. 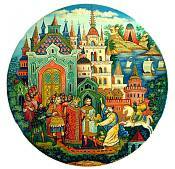 The merchants told Tsar Saltan a lot about the island of wonders and finally he decided to visit it. When his fleet of three ships arrived at the island, he was amazed by the singing squirrel, the knights, and the beautiful princess. Then Saltan saw his beloved long-lost wife and realized that Gvidon was his son. They celebrated their reunion and lived happily after that. From a poem by the Russian poet Aleksander Pushkin. Narrative and translation: Copyright 1996, 1998, 2001. Andrew and Tatyana Stonebarger. Editor: Donna Richardson. Search results:Page 1 of 5 total pages with 37 results. 5.00" x 7.25" x 7.75"
2.25" x 1.00" x 5.50"
5.75" x 5.75" x 1.25"
3.75" x 3.00" x 4.00"